a new insecticide from BASF that demonstrates a fast knockdown, broad spectrum of control. 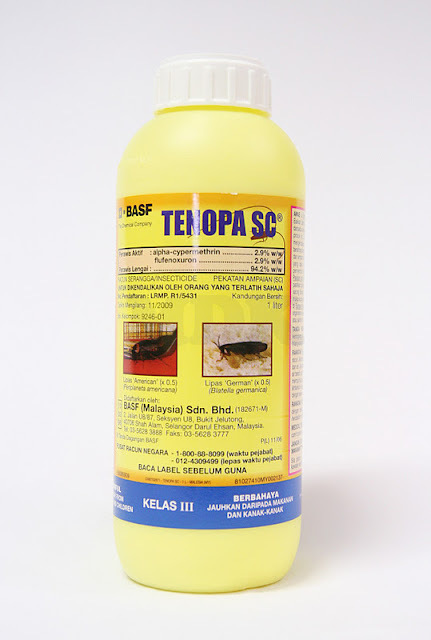 TENOPA SC is formulated as a water-based suspension concentrate (SC) which optimizes the activity of both active ingredients in a residual surface spray that does not corrode, or stain, and hence, is particularly suitable for use in domestic and public areas. The SC is a particulate formulation suspended in water which provides greatly increased residual control compared to solvent-based formulations, especially when applied to absorbent surfaces such as mortar, brick, or cement. In addition, TENOPA SC does not stain, or corrode and application rates are low that spray deposit is practically invisible. It may, therfore, be used with confidence, even in sensitive areas such as SWIFTLET HOUSES.